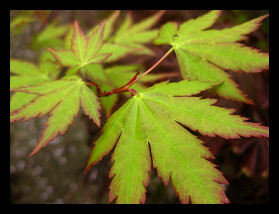 Acer Palmatum (un-named) @ £5.00, 7.50, 15.00, 20.00 & 25.00. 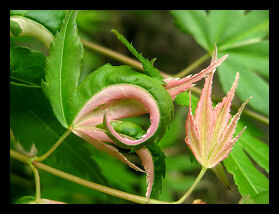 Larger Acers, up to 1.5 metres height, including some of the following species, individually priced according to size & variety. 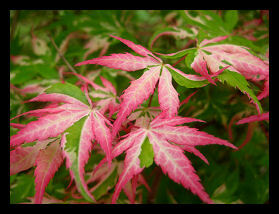 Named varieties @ £15.00 each: approximately 12 - 18 inches (3 year grafts). Please check availability of specific varieties as quantities vary considerably from year to year. Attractive medium bush. Spring growth pink/white/green. Summer foliage medium green with strong irregular markings. Small irregular leaves. 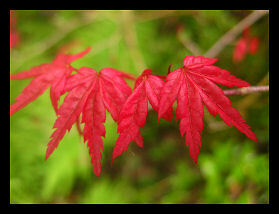 Brilliant scarlet-red in spring, turning pinkish-red to red-green in summer. Attractive small leafed medium bush, with cream on pale green variegation. New leaves briefly brilliant carmine red. Lighter green often reddish bronze edges. Upright form to 4m (unusually as wide as tall). Unusual leaf form:crinkly, turned up others twisted downwards - unique appearance. Colours very changeable. Excellent purple-red (almost black-red iridescent). Deep colour through summer. Crimson in autumn. Upright form: max. ht 7m. Famous for intense crimson autumn colour. Green in spring. Hardy, sturdy, grows fast early hears then slows. Max height 8m. Outstanding feature Coral colour bark. Green foliage in summer. Showy yellow-golden tones in autumn. Brilliant coral bark in winter. Hardy upright, 7m in 25-40years. Bright green bark on young wood. Green leaves with white streaks, flecks, and blotches. 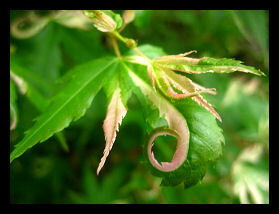 Large greenish leaves pink flushed in spring becoming greenish bronzed with pink dots.Upright habit to 4m x almost 4m over 15 yrs. New shoots & leaves covered by fine silver hairs. Rich deep red colour held longer than many other cultivars. Late summer bronze, green. Rich, bright red tones prominent in autumn. Bronze red in spring, brilliant tone. 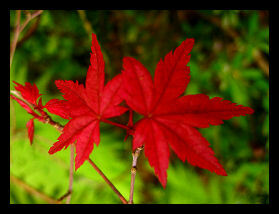 Greenish late summer - prominent crimson red in autumn.